Long before the Bone cousins were ever lost in the uncharted desert on the outskirts of the Valley, Big Johnson Bone, the discoverer of the Rolling Bone River, founded Boneville. But little is known of the mighty explorer's adventures before he started his famous trading post. So when Smiley Bone sits down with a group of young campers to retell the legendary stories of Boneville's origin and its tough, no-nonsense founder, what they hear are tall tales in typical Bone fashion--wild antics complete with rat creatures, dragons, and a snarky little monkey! Previously published in black and white as Stupid, Stupid Rat-Tails, this edition will feature new material and full-color art! As described, Bone: Tall Tales is a "sorta-new collection of Bone material." 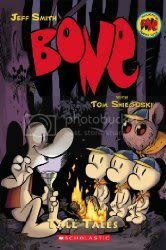 The "new" part comes in the first four chapters, where Smiley Bone and Bartleby are taking three young Bone Scouts out on a camping trip and they talk Smiley into telling them some stories, all of with end up being about Bog Johnson Bone, the founder of Boneville. In the first of the two stories concerning Big Johnson Bones younger days, we find out about his birth and what Old Man Winter had to say about that. The second story is missing from this uncorrected proof, to be added at publication, so I can't really have anything to say about that. The fifth chapter is a reprint of the Stupid, Stupid Rat-Tails story, so this is the "sorta" part of the collection. It was still fun to revisit this story, as Tom Sniegoski's humor is really quite funny in the story. This chapter deals with Big Johnson Bone's first encounter with the rat creatures and how he saved the forest from their tyranny, and also tells the tale of how they lost their tails. I love Bone. If you haven't had a chance to read the main story, I highly recommend it. Jeff Smith starts out with what seems like a cute, whimsical little story and turns it into an epic tale of dragons, magic and redemption. The one fact that I'm a little torn on with this new volume is the coloring. The original Bone was published in black and white, and Jeff Smith's art is really suited for black and white. However, this new edition, keeping with the rest of the Graphix/Scholastic reprints of Bone, is being colored, and I'm not really sure that I like it all that much. The first chapter of this uncorrected proof is colored, and the rest is still presents in black and white, and I can honestly say that the coloring isn't bad, but I'm so fond of the black and white illustrations that I don't think I like it all that much. Oh well, it certainly isn't going to keep me from picking up the final edition when it's released. A good little addition to the Bone library.